By the 1890s, Main Building, originally designed to house all the college facilities for 350 students, had become overcrowded. 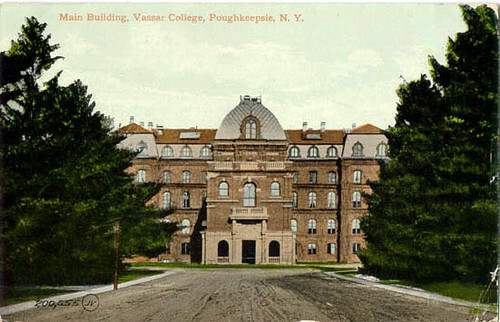 The Vassar Brothers Laboratory had been built a decade earlier to relieve the cramping, but now the library threatened to overflow its physical space. First located on the third floor and then moved to the second floor of Main, there was now no place large enough to accommodate Vassar's growing collection. So in 1893 Uncle Fred, who shared President Taylor's aversion to expanding the work of the college beyond Main Building wherever possible, donated the funds for an addition to be put on the front of Main to house the library. Known as "Uncle Fred's Nose," and "The Soap Palace" (for the veined marble's similarity to a popular brand of commercial soap), the Frederick Ferris Thompson Annex, designed by Francis R. Allen, stood for the next 67 years. 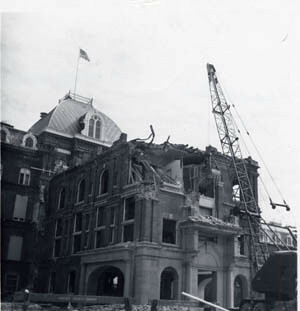 Adding the annex required the demolition of the magnificent double-staircase facade designed by James Renwick, Jr. The destruction of Uncle Fred's Nose. The library quickly outgrew even its expanded quarters, however, and shortly after Thompson's death, his widow dedicated the Frederick Ferris Thompson Memorial Library, which has stood for a century as of 2005. The annex was converted into offices, and in its time housed the President, the Dean, and the Recorder (now called the Registrar). In 1959, the remodeling of Main Building began with plans to demolish the annex. The Annex was taken down in the spring of 1960. A ceremony which took place on March 8, 1960, included President Sarah Gibson Blanding and Class President Gail Jarvis '60 striking the first blow after a ceremonial last car ride through the archway. Professor C. Gordon Post impersonated Thompson and Georgia Avery Kendrick, Lady Principal at the time of the annex's construction, for the occasion.